This weeks Bloggers Challenge was to use the colors, Old Olive, Really Rust and Riding Hood Red (you could add Vanilla/Confetti/White if needed). Well....I really had all good intentions of sticking to only those colors, but I felt my card had better WOW appeal if I added some black layers..I'm much happier with it this way. If you'd like to play along with this weeks challenge, simply leave your blog link on this post, or if uploading to SCS, please use keyword BC69. If you'd like to order the products used here you can order them directly from my website - or email me to place your order. Great card.I really like the black accents! it makes the card pop. Love this -- very pretty card. That is a very eyecatching card! Oh Lisa...another fabulous creation. Love the black accents...now why didn't I think of that?? You ROCK! 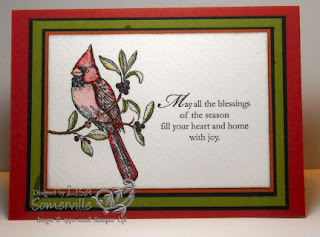 Love cardinals and this card is pretty! Lisa, this is sooo pretty! Love how this has turned out! TFS! Quite beautiful, Lisa and very caseable! You are great! Black is a neutral, so it's allowed. I used black on my card too. This is gorgeous. I love the coloring on your bird - great job! The black accents really make the card pop. Beautiful job!! This is beautiful Lisa! I love the black and all the layers! Beautiful card. This set is perfect for the challenge (even if you cheated with the black, lol!). I have issues with bird sets. It really takes me some time to warm up to them. In fact I'm just starting to like the bird from "always". This bird too, is starting to grow on me. I love this color combination with it. Some of the card's I've seen the colors were not quite right. This is perfect! Thanks for helping me break out of the little box. this is beautiful! i, too, had to cheat the color list a tad. the black really adds depth to your layers..genius! Super Pretty. I love the Cardinal image and you did a great job coloring the image. it is beautiful! I think the black does make it very striking! This is a beautiful card Lisa, pretty. This is so pretty. Again, I can not wait to get this, lol. Any day now. Simple and elegant....but on closer inspection, I see 6 layers!! WOW! The black makes everything POP...lovely. The black accents are just the right addition! Beautiful stamp, too! Beautiful, Lisa! The black really adds to the card.